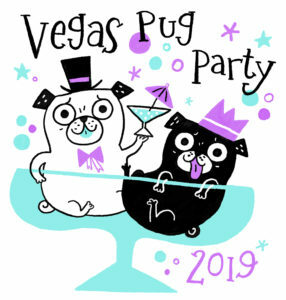 Our BIG PUG WEDDING will be held at the Lake Las Vegas Hilton Event Center March 2nd, 2019 from 7pm-9pm. Tickets are required for this event and can be purchased HERE. The biggest dog wedding according to Guinness is 178 pairs- we want to break that record! We all know that once your pug enters your heart, it’s a done deal. Why not commemorate this commitment with a bunch of people who are equally head over paws in love with their snorty little furbabies?! We are very excited to announce that we will have the #1 Concert Elvis – Heart of the King – Frankie Castro performing our wedding ceremony, and then performing afterward at the reception! Frankie is ordained and licensed so if you want to make this an official wedding, contact us ahead of time cause we can make that happen too! Who wouldn’t want to get married by Elvis surrounded by pugs in Las Vegas??? Marry your pug! Have your pug get married to other pugs! Renew your own vows! Mix it up! We have a liberal definition of marriage, so let this be a declaration of lifelong commitment and love, regardless of breed, age, gender, or orientation. WE LOVE LOVE! You don’t have to get married or have a pug getting married to join! Be a guest at the wedding, be a flower pug, or a ring bearing pug, etc! All that matters is to have fun!